Hybrid SUV Review: The GMC Yukon Hybrid drives with the power and oomph of a full-size SUV and it gets drastically improved gas mileage from its hybrid powertrain. Mileage is improved 50 percent compared with the non-hybrid Yukon, according to government ratings. It's remarkable how much hybrid cars have changed lately. A few years ago, the only hybrids you could buy were itty-bitty commuter cars like the Toyota Prius and Honda Civic Hybrid, which use small gas engines and powerful electric motors to get their mileage figures to stretch into the ionosphere. Today, most people still think of hybrids as small, hyper-efficient commuter cars. But the technology has actually branched out to include all types of vehicles, from the massive Chevy Silverado Hybrid pickup truck to the powerful and luxurious Lexus LS 600h L, which costs over $100,000. And when you think about it, that makes more sense than hybridizing the tiny cars that are already fuel efficient to begin with. Let's do the math. The hybrid-powered Toyota Prius is rated for 45 mpg in the city, compared with 27 mpg in the similar-size Toyota Corolla. If they both drive 100 miles in town, the Prius uses 2.2 gallons while the Corolla uses 3.7. That's a fuel savings of 1.5 gallons for the Prius driver. Remember that number. Now let's compare the gas-powered Yukon, which gets 14 mpg in the city, with the hybrid version, which gets 21mpg in town. 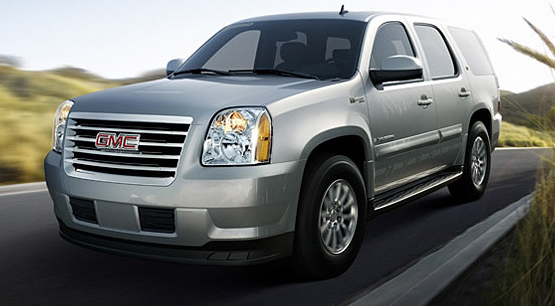 Over 100 miles, the normal Yukon would use 7.1 gallons of gas, while the hybrid would use just 4.7. That's a difference of 2.4 gallons, or almost a gallon more fuel savings than in our Prius comparison. So if your goal is to save the world from evil hydrocarbons, you'd be much better off converting all the SUVs to hybrid power than you would to convert the small cars. You get a far bigger impact in the sheer amount of fuel being burned. And best of all, you don't have to trade off the performance of an SUV to get these fuel savings. The Yukon Hybrid can tow up to 6,200 pounds with its 332-horsepower V8 engine, and it accelerates with the rumble and quickness of any other V8-powered monster. It doesn't lack for power. Plus a digital display on the Yukon Hybrid's dash shows power being routed from a bank of batteries to the electric motors that give it a boost when accelerating. Because driving a hybrid is as much about fashion and politics as it is practicality, GMC offers some options that make the Yukon Hybrid stand out visually. You can't miss the huge "HYBRID" stickers plastered onto its sides, along with more "HYBRID" markings on the front and rear glass and green logos sprinkled all over the body. It wants to scream about its ecological credentials. Other than that, the Yukon Hybrid is basically like any other Yukon. It has a few aerodynamic tweaks and weight savings that most people won't notice and it drives almost exactly like the plain ol' gas-powered Yukon. That's a good thing. What was tested? The 2009 GMC Yukon 2WD Hybrid with a base price of $50,920. Options on the test car: Rear seat entertainment system $1,295, power sliding sunroof $995. Total MSRP price as tested including the $950 destination charge: $54,160. Why avoid it? It's fairly pricey, and it still only gets 21 mpg in town. Why buy it? It has the same V8 muscle, roomy cabin and impressive towing capability of a full-size SUV, but it gets vastly improved gas mileage from its gas-electric hybrid drivetrain. Bottom Line: It's another reminder that hybrid technology isn't only used on small, fuel efficient imports. It's also available on big, muscular vehicles, which is really where it makes more sense anyway.